When it comes to maintaining healthy sinuses, rely on natural solutions that have been used for thousands of years. The wonderful blend of herbs in Herbal Neti Soother is designed to provide a daily restorative bath for your healing sinuses. The most soothing and restorative Neti solution ever! Don’t be one of 40 Million Suffering from Sinus Problems. There are dozens of sinus relief methods on the market; ranging from antibiotics and antihistamines in the pharmaceutical world to sinus surgery in the medical world and even to neti pots in the world of holistic medicine. While pharmaceuticals are still relatively new to the market, relief using neti pots have stood the test of time, as they were developed thousands of years ago as an important part of the preparation for the Ayurvedic practice of yoga. While using saline in neti pots works just fine for soothing inflamed sinuses and rinsing away some mucus, traditional usage does not facilitate healing. This has driven companies like Nature’s Rite, a pioneer in all-natural herbal remedies, to develop specialized neti pot sinus solutions. The healing herbs of Herbal Neti Soother support your body’s return to health in ways that no saline rinse can dream of. In order to bring balance to its line of neti pot solutions, founder and innovative herbalist Steve Frank came up with a second solution which is called Herbal Neti Soother™. 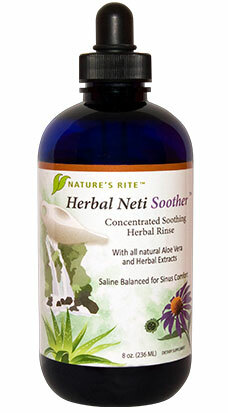 True to its name, Herbal Neti Soother™ is a gentle blend of herbs in saline. Eucalyptus is traditionally used for soothing and cooling sensations while also serving as an antiseptic. Calendula complements the soothing ability of the Eucalyptus while also providing comfort to irritated sinus tissues. The all-important Aloe Vera is wonderful for all sinus tissues while also providing additional soothing abilities. Grapefruit seed extract provides stability for the entire solution. Overall, Herbal Neti Soother™ makes an ideal counterpart for Super Neti Juice™ and transforms your neti pot into a powerful sinus supporting tool.